Low-Level Laser Therapy - Pamela Morrison Pelvic Pain Physical Therapist, P.C. Low-Level Laser Therapy - Pamela Morrison Pelvic Pain Physical Therapist, P.C. 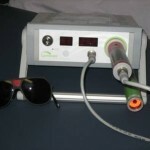 Low-level laser therapy (LLLT) is a form of cold laser which uses only light energy to stimulate healing at the cellular level. The patient does not feel any heat from its use. Clinical applications include use in wound healing, tissue regeneration, and pain reduction. LLLT promotes vasodilation which improves blood supply and stimulates collagen formation by activating fibroblasts and cells, such as mitochondria, that are involved in healing tissues. It reduces pain by affecting nerve signals and alters the action of chemicals in the inflammation process. It has been proven to effectively treat carpal tunnel syndrome and can alleviate pain and inflammation for other diagnoses such as chronic pelvic pain related to bladder pain, neuralgias, vulvodynia, prostatitis, and other conditions such as sport injuries. It has also been used to treat infertility issues. At Pamela Morrison Physical Therapy, all the therapists are skilled in the use of this cutting edge device and its applications.